Wow, once again AASC Members committed to the Tour in numbers, as we did 3 years earlier. 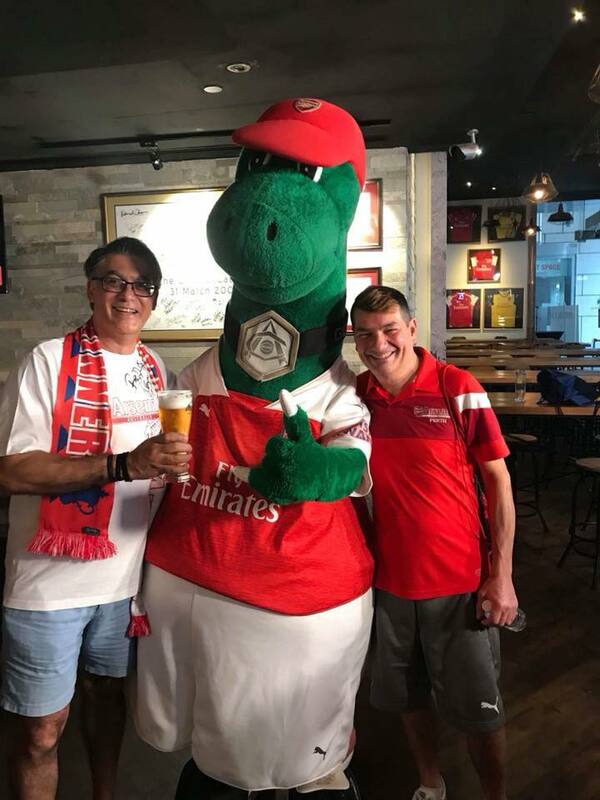 Once it was formally confirmed, Mick Barlow quickly worked his magic and secured match tickets for our Members so they could be seated together in the Arsenal Active area behind the goal. 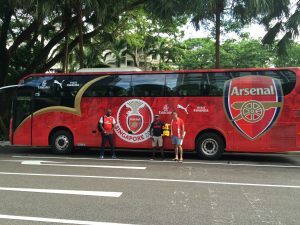 As Tour Leader, Kevin Sanders, picked up the tickets from our fellow Gooners at Arsenal Singapore and the Tour fun was on! 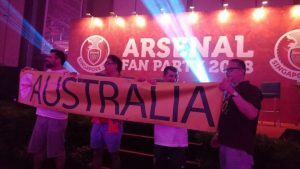 Wednesday saw fun and games, literally at the Shangri-La Hotel where the players were staying at the Fan Party. 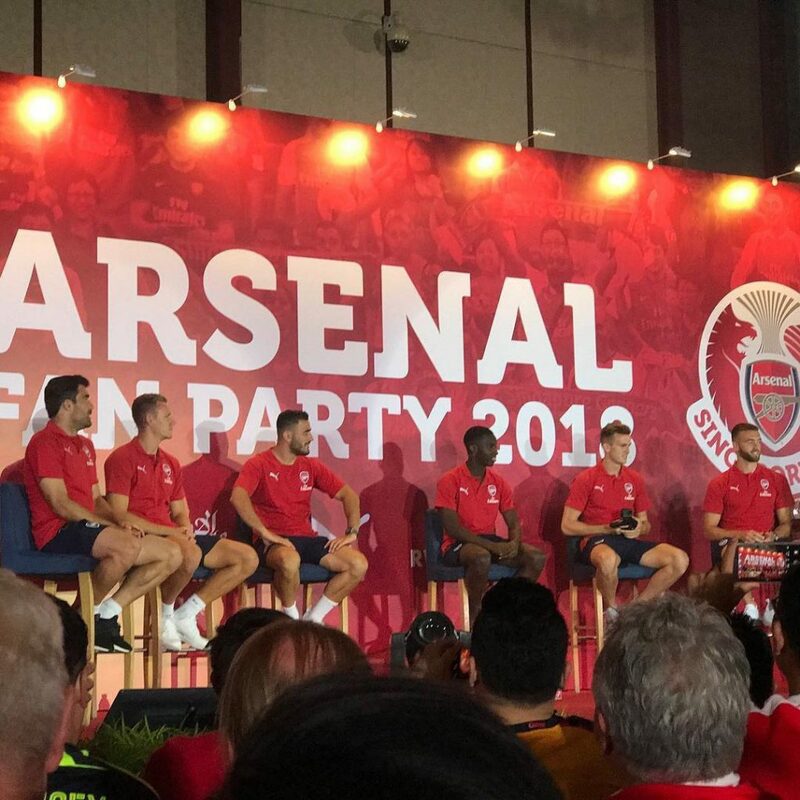 Tickets for this event and others were secured via our connections with Arsenal in London, which allowed us entry to watch Arsenal’s pitch side presenter Nigel Mitchell engage with Chambers, Holding, Sokratis, Nketiah, Leno & Kolasinac. 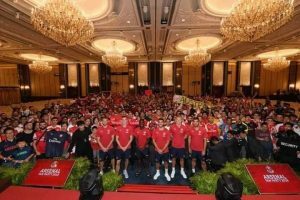 The players took part in a drawing competition, learnt about Singapore culture, the Malay language and answered questions from fans. Later they were joined on stage by Gunnersaurus & club legend, Ray Parlour, the latter sharing funny stories from his playing days. Later that evening we enjoyed a Members Dinner in Little India and crashed after a long day in the heat. The next day was Match Day 1. 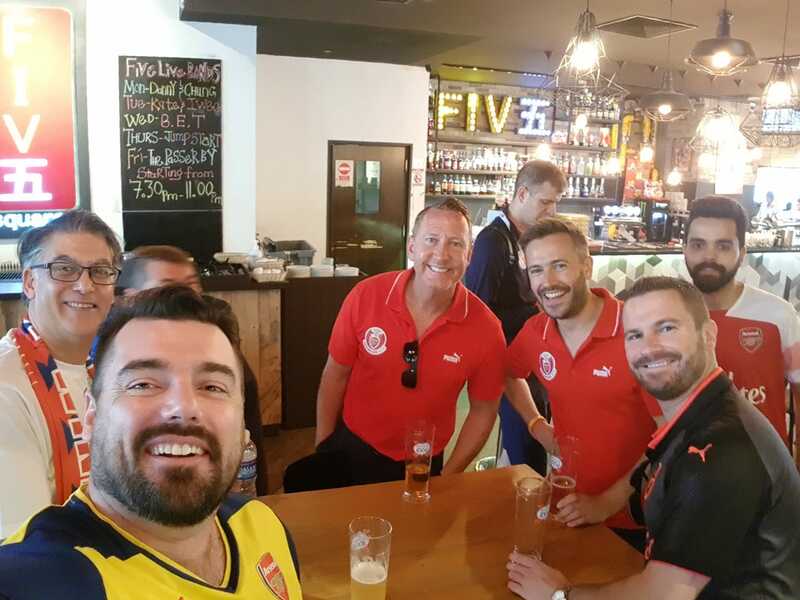 The Athletico match was preceded by a meet up at 5 Square, the official Arsenal Singapore Supporters Club venue for pre-match thirst quenching purposes of course. Then it was off to the Singapore National Stadium to secure the Arsenal Australia banners behind the goal and enjoy seeing the ‘new’ team perform. Whilst we lost the match on penalties, after a draw after 90 mins, the team worked hard to put Unai’s new ideas into place. Smith Rowe’s sensational goal, Matteo’s energetic performance along with Petr Cech with actually saving a penalty were the highlights for many of us. 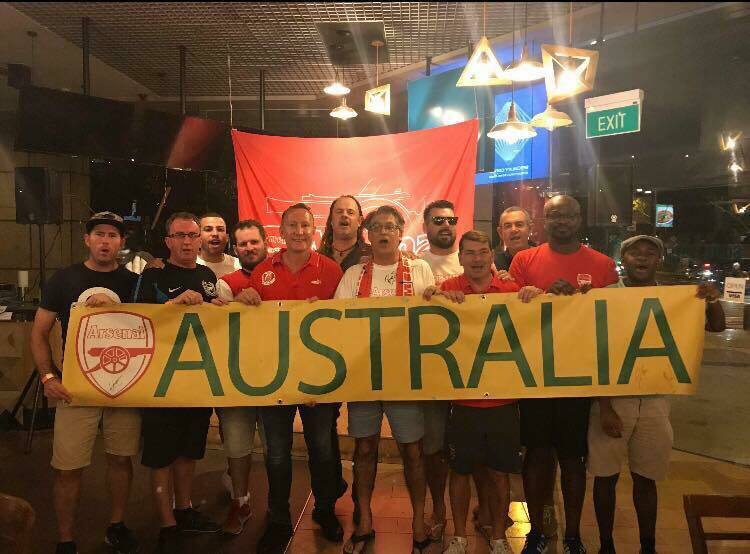 Members left the Stadium hoarse after getting the locals to join in with our singing so retired to the nearest bar to repair our throats! Friday was a big one! 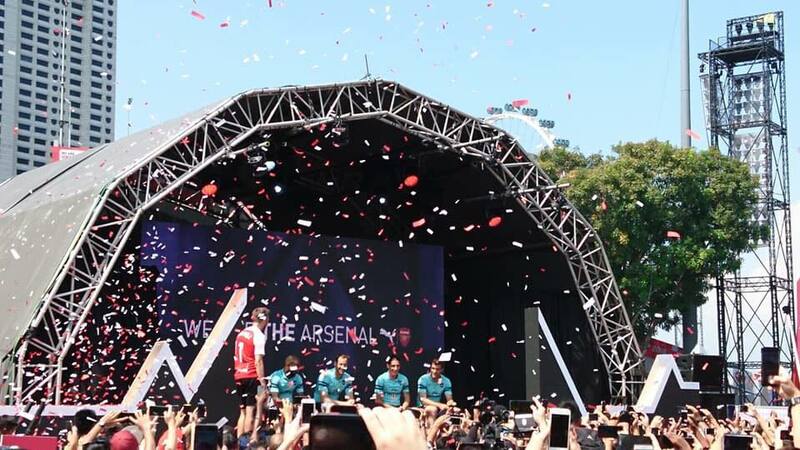 The hottest day we experienced coincided with the Puma 3rd Shirt Launch, out in the open air in the afternoon. 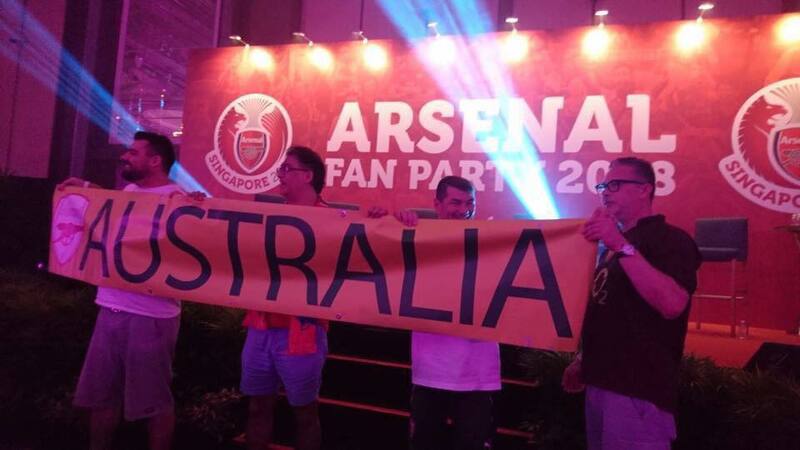 We of course timed it perfectly to leave the air-conditioned pub to enter the Fan Zone to watch the unveiling of the new ‘mint’ shirt and then quickly retire to the safety of the bar. 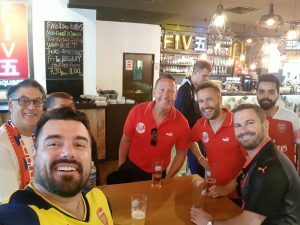 Previously the Shirt Launches we have attended were conducted at night, and even the Arsenal people were staggered by the ferocity of the sun. The players put on a show by engaging with the brave local fans who dealt easily with the sun with and played games and signed shirts. Once we were re-hydrated (!!) 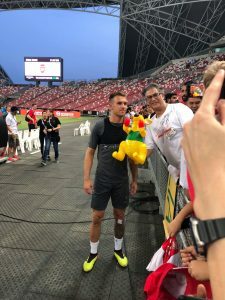 it was off to the Open Training Session which we had also secured tickets directly from Arsenal for, to watch Unai run the squad through their paces. As in Sydney following the session, the lads were happy to pose for photos and sign anything put in front of them. Finally, we left the stadium to head over to 5 Square where Arsenal Singapore had organised an evening with Ray Parlour with food and wine included. Another brilliant evening in the company of Gooners from around the world including Robbie from ArsenalFan TV, was had. 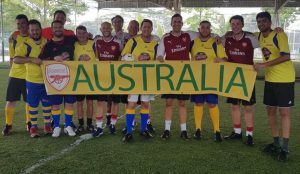 An early start to Match Day 2 on Saturday morning was required to attend the Supporters Clubs Football Tournament. 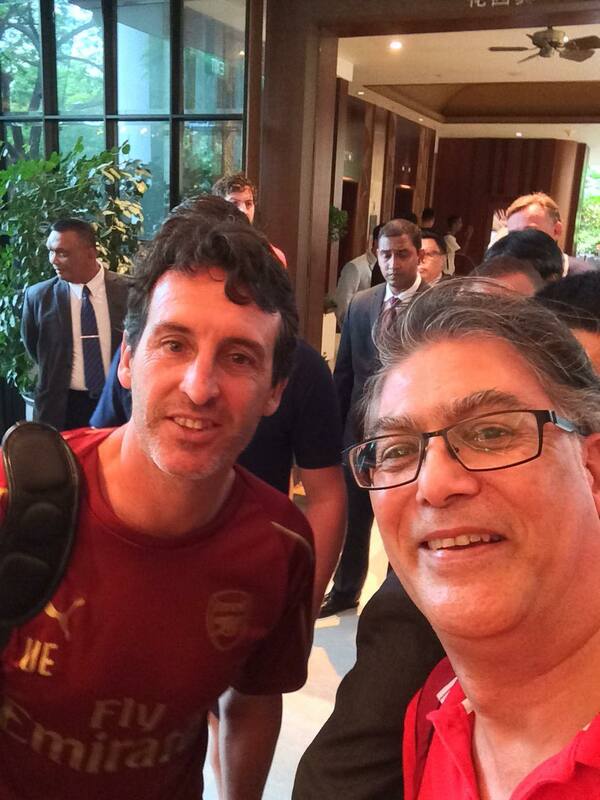 Unlike in Sydney, Arsenal Media were joined by 2 other ‘staff’ teams, including a certain Ivan G! Two of their teams made the Semi’s and one of them won the Tournament. So once again The Arsenal win, so it’s all good huh?! Our squad performed well in the so-called Indoor Arena’ (tin roof above the plastic grass surface!) considering the amount of alcohol consumed over the previous 3 days! 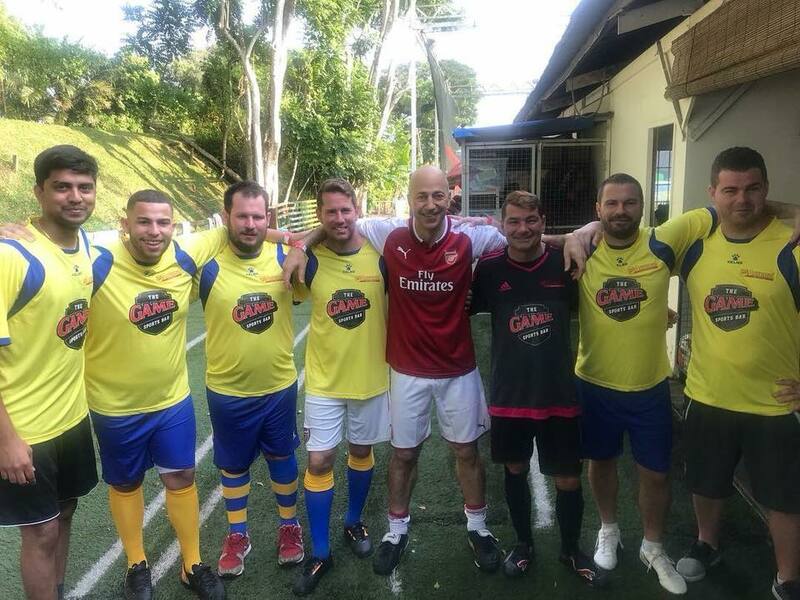 Highlight of the event was watching Sean ‘Neymar’ Gavin roll forever across the pitch when he has knocked off the ball. Some may argue Ivan G pulling his hamstring in the first match was also a contender! In summary this was another fantastic event run by Arsenal Singapore and was followed by well-earned relaxing ‘pool time’ before the big game later against PSG. 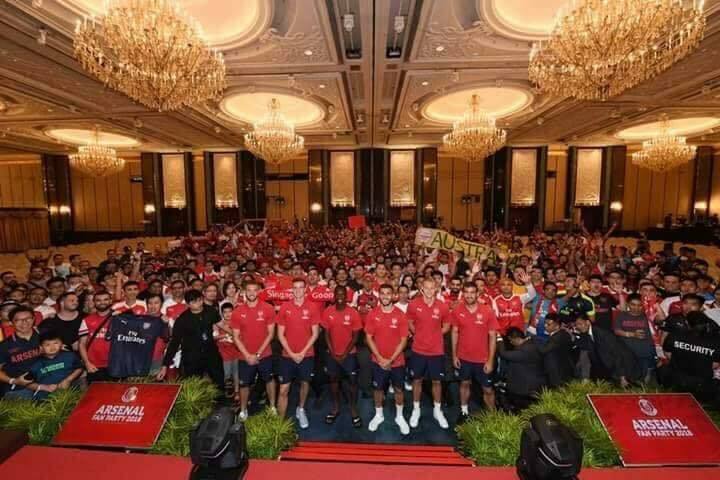 A full house of 50,000 greeted the teams on a hot and humid night and the players from Arsenal did not disappoint them. A 5-1 thrashing (and it could and should have been more!) was thoroughly enjoyed. 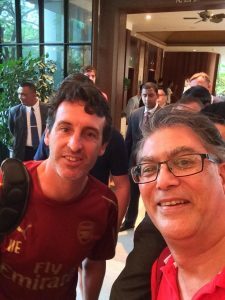 The blending of the new players with the established players was great to see and the new game management approach Unai was instilling on the training ground was certainly coming to life. A long last night of celebrating followed and we all started making our trips back to Oz the next day. I would like to say a massive WELL DONE! to all our the Members who travelled and represented our Club so well. 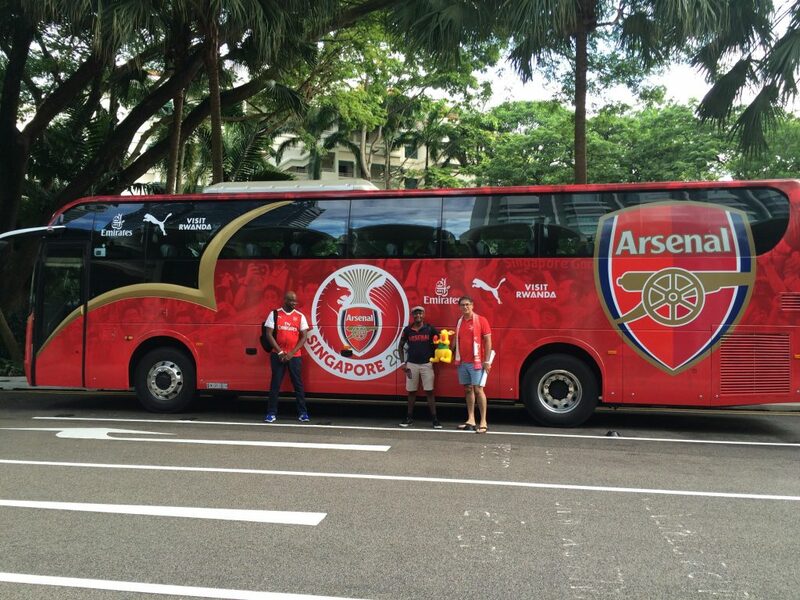 We are already looking forward to attending the next Tour wherever Arsenal decide to hold it! As you would expect whenever we could we promoted the benefits of an early return to Australia, with much spruiking done for Perth and Melbourne to host the Club next time. 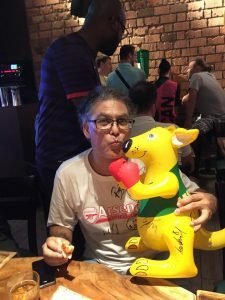 Finally, special thanks go out to Kevin Sanders for leading the Tour so well along with Lyle from WA for organising the Football Tournament.